099-0214-921 Fender USA Strat Neck 21 Medium Jumbo Frets Channel Bound Rosewood Fingerboard Compound Radius 9.5" to 14"
21 Medium Jumbo Frets, Channel Bound Rosewood Fingerboard, Compound Radius 9.5" to 14"
Crafted in the same facility as our U.S.-made instruments, the Channel-Bound Stratocaster® Neck combines a uniquely elegant aesthetic with a distinctively smooth fret-hand feel. 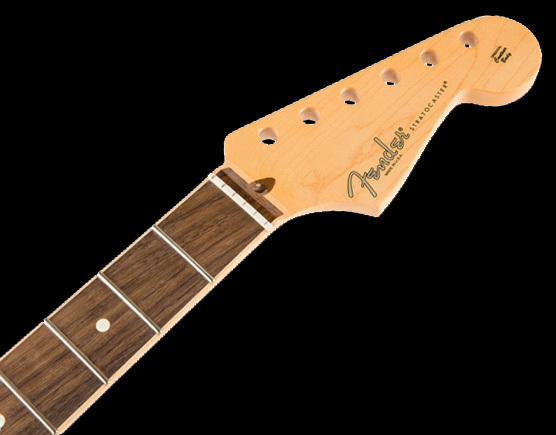 The “channel-bound” fingerboard is a unique Fender innovation whereby the fingerboard is directly inlaid into the neck, eliminating the side seams while combining slick style with astounding fret-hand feel. The 9.5”-14” compound-radius rosewood fingerboard is more rounded towards the nut for easy chording, while the flatter radius in the upper register allows wide bends without fretting out. The comfortably rounded fingerboard edges and “Modern C”-shaped profile are ideal for any playing style. For those that don’t like to feel the ends of the frets when moving up and down the guitar neck, a bound neck is an option that can offer a smoother trip up and down the fingerboard. Binding is the practice of taking a strip of material—typically vinyl—to line the outside of the fretboard. That material decoratively covers the end of the frets that press into the wood (otherwise known as the “tangs”) at the edges of the fingerboard. 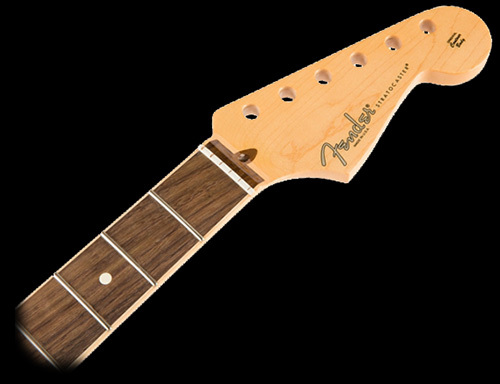 Originally introduced with the Fender Select Series in 2013, the channel-bound necks have a compound-radius fingerboard inlaid directly into the neck, eliminating the side seam between the neck and fingerboard. To achieve this seamless effect, the sides of the neck channel are actually angled inward in a revolutionary process to encase the fretboard and offer enhanced resonance between the neck and fingerboard. “We were thinking about a way to inlay the fretboard like you inlay blocks,” said Fender Senior Vice President of Products Justin Norvell. “It was just an idea, but it turned out that it gave you the cool look of binding with wood instead of vinyl. These channel-bound necks boast a fretboard with a 9.5”-to-14” compound-radius (9.5” to 14”) fingerboard that is rounder at the nut—perfect for chording—and flatter at the heel—great for soloing, while the neck itself is a versatile “Modern C”-shaped profile.